With the launch of the new Starbucks Verismo ($199.99 on starbucks.com), it’s now easier than ever to sip your favorite cup of coffee anytime of day from the convenience of your home. The Starbucks Verismo is a single-serve coffee machine with a pod system to brew a single coffee cup or shot of espresso. The Verismo uses “Swiss engineered high-pressure technology“ and a simple three button to brew a combination of drinks that you can find in actual Starbucks cafes, including an espresso, Caffè Latte and Americano. If you want a traditional roasted cup of coffee, Starbucks sells a standard blend that spans their Blonde, Medium and Dark coffees. With other ingredients that you can purchase at Starbuckstore.com you can make a Vanilla Latte, Caramel Macchiato and Caffè Mocha. 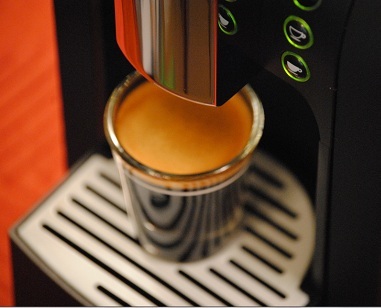 Having tried the Verismo first-hand, it brewed a delicious cup of coffee, and was simple to operate. My favorite feature on this system was the disposal of the pods: the empty pods drop inside the Verismo machine with a tip of the handle until you’re ready to dump them into the trash later. (Starbucks reports that technology doesn’t currently exist to make them recyclable.) I would note that during the discard process there’s drops of residual coffee that will drip into your glass, but it’s a small issue in an otherwise a solid product. The coffee smells like you bought it at a Starbucks cafe, as it should, seeing as the pods use the same Arabica beans that you’ll find in store. The pods will range in pricing from $9.95 for a 12-count of milk pods, up to $12.95 for a 16-count Caffè Latte Pack that has eight Espresso and eight milk pods. If you want one of Starbucks' signature drinks, it will cost you a little more, with Verismo Mocha and Vanilla Latte Kits ranging in price between $20.95-$22.95 and as high as $43.95 for a Caramel Macchiato Kit. This may sound expensive, but depending on where you live in the country you could actually be saving money by brewing Starbucks coffee drinks at home. 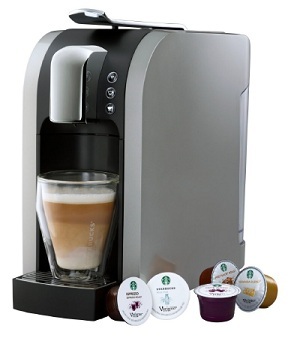 Competing with systems like the Nespresso, Keurig and Tassimo, the Starbucks Verismo brews a great cup of coffee with an entry price of $199 or the crème de la crème Verismo 585 for $399, which includes a larger water tank, internal filtration system, temperature control and an LED display. While no barista jobs are in danger, overall, Starbucks did a great job at delivering a cup of coffee in a $200 machine that stacks up well against what you buy in a Starbucks café. So you can get the same mass-produced coffee that you can get at any of 40,000 locations of their push-button-monkey baristas. Facts: Its the ALDI Expressi machine and its German engineered by Krüger GmbH, but they felt swiss-engineered fit better. Good read. It seems very nice to think that you can have a cup of Starbucks coffee right at home. Thanks for sharing.